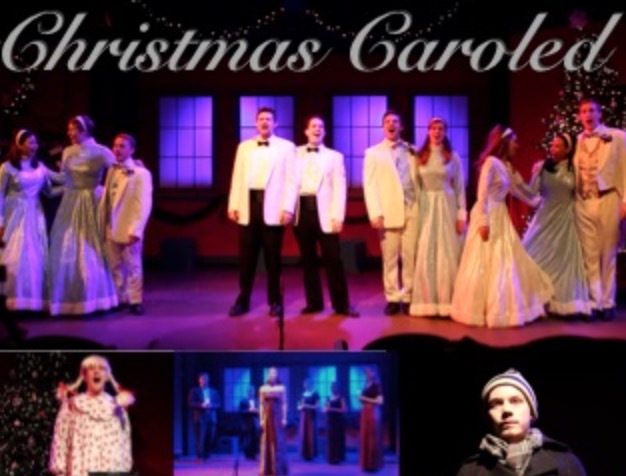 There is a lot to like about the new musical, Christmas Caroled at the Encore Musical Theatre Company, not the least of which is a superb ensemble cast that makes some really terrific music together. A framing mechanism that finds a grumpy down-on-his-luck Abner Z Scruggs (get it?) falling asleep and dreaming about his work as a tv-variety entertainer in 1964, gives way to the majority of the 75 minute show, which takes place on that very same Christmas tv “special” – remember those? Songs are sung, jokes are told, and lessons are learned. While the book itself is a work-in-progress for writer/Director Dan Cooney and co-writer Dayle Ann Hunt, there is no doubt what the star of this show is — and that is the music and dance that comprise the tv special itself. Its great to see something new and original, and I’m looking forward to seeing the inevitable changes to the book down the road. There are warm performances here from Pete Podalski and William Stutts Jr as the show’s co-hosts, and lovely vocal work by Jess Alexander and Mahalia Greenway. Sebastian Gerstner and Callen Snyder comprise the male “show” ensemble, while Bryana Hall, Erika Jost, Colleen Kartheiser, and Teola Lutsker are the female show ensemble. Mike Szymanski and Tim Brayman play smaller parts in the “studio”. Music director Chris Rayis (keyboard) does excellent work with the vocals arranged by R. MacKenzie Lewis of 27 seasonal holiday songs, supplemented by Billy Harrington (percussion), and Andrew Ewing (reeds). There’s a lovely set that converts from rundown apartment to shiny TV studio set by Dan Walker, though the lighting seems murky and underlit in some sequences. Sharon Larkey Urick has designed nifty costumes for the studio cast, though the fit is not great on a couple of the men. Kristi Davis has created choreography that fits the period well, and is very clean in its lines and execution. Frosty makes an appearance! Overall, the imagery created by Cooney and Davis captures everything that you remember from those tv shows from the 60’s and 70’s. Jess Alexander looks eerily like Bing Crosby in one of the sequences, with his knit cap and scarf, though I am pretty sure that the goatee on Mr Stutts is not period-correct. None-the-less none of that really matters here — what matters is that this is a fun and tuneful holiday musical that is sure to keep a smile on your face and even get you feeling a bit verklempt from time to time. And that’s not bad for a Christmas musical at all.